Studio Trigger’s SSSS.Gridman anime is well underway, having just aired its first episode earlier last weekend. 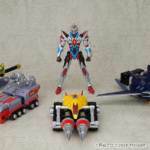 Remember that awesome DX SSSS Gridman set that we first saw at Wonder Festival some time ago? Goodsmile released new photos of this set via Figsoku, giving us a much clearer look at this toy. The pricing of this set has yet to be disclosed as of this writing, for now, all we know is that this will come out sometime “Spring 2019” according to the images shown. In the meantime, we do have these four new images to enjoy so hit the jump and check them out. 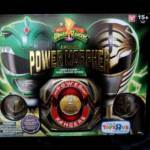 SDCC had some powerful exclusives for Power Rangers collector’s this year. Exclusives that are now making the rounds at a number of North American conventions such as Fan Expo Canada and New York Comic Con. Today, we’re taking a look at by far the most spectacular of these exclusives with the SOC Soul of Chogokin GX-72B Black Megazord! The Black Megazord/Daizyujin is an elaborate repaint of the original SOC release, primarily in black, with a plethora of gorgeous gold trim, green accents, and silver chrome. This color scheme is directly inspired by and meant to compliment the Soul of Chogokin Dragonzord/Dragon Caesar, which is a bit of a different take on the black repaint tradition than we usually get for MMPR or Zyuranger. Each of the Zords functions identically to the first release, but they look so spectacular in these new colors. We’ve included a number of comparison shots with the first release, with some fun mix & match possibilities as well. Attached are 120 images of this gorgeous set. You can also read up on our full review of SOC Black Megazord in the full gallery thread by clicking “Discuss on the TokuNation Forums” at the bottom of this post. And don’t worry if you’ve missed one of it’s various con releases either, it’s being made available through the Tamashii Web Shop in Japan next year as well. Revealed originally at Power Morphicon, and confirmed for release via Figure Oh, we finally have official images for the SOC Soul Of Chogokin GX-85 King Brachion! The mighty Brachion (Titanus for those of us in the west) rounds out the MMPR/Zyuranger Chogokin collection for many fans. These official images give us a great sense of the impressive scale of this figure next to the other Guardian Beasts and shows off the combined Ultimate Daizyujin/Dino Ultrazord mode. SOC King Brachion/Titanus will be released as a general retail item in February 2019 for 29,160 yen. Thanks to some fresh scans floating around from this month’s Figure Oh we have release information on a selection of new S.H. Figuarts, but more on that in a minute. In the mean time this issue has just confirmed official release information for Soul of Chogokin GX-85 King Brachion! This figure was just revealed to be in the works at this weekend’s Power Morphicon 2018 under it’s western release as Soul of Chogokin Titanus. Figure Oh confirms that King Brachion is headed for a February 2019 release at 29,160 yen. Which seems to be a bit under most people’s expectations on price. Brachion also appears to be a general retail release, likely because of it’s western distribution as Titanus. With these confirmations we can expect official images of the figure to be released in the new future. When they are, we’ll be sure to update our ongoing discussion thread. Just revealed only hours ago to the general public, we have brand new up close and clear images of Soul Of Chogokin Titanus AKA King Brachion! Whether you’re a fan of Mighty Morphin Power Rangers or Kyoryu Sentai Zyuranger, this massive mighty carrier will make a fine addition to your collection. While currently we still have no idea what the release window and price are looking for at this time, we can see that this will be an impressive companion to your SOC Megazord (Daizyujin) & SOC Dragonzord (Dragon Caesar). We’ll keep you up to date as more new information becomes available. Be sure to follow us here and on our social media on twitter @TokuNation or check in with our man on the ground at Power Morphicon 2018, @TokuChris! DX SSSS Gridman Set Revealed! With the release of Studio Trigger’s SSSS Gridman Anime drawing near, we’ve seen a slew of Gridman related merch coming out of the woodwork. It’s Summer Wonder Festival right now, and Goodsmile just revealed their take on a DX SSSS Gridman based on the new hero’s design. 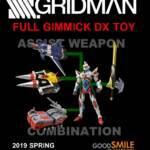 We can only assume that this means Goodsmile plans on releasing this Gridman figure together with his auxiliary vehicles but for now, there doesn’t seem to be much info to go so we can’t be sure if this is part of a preexisting Goodsmile line or it’s own thing entirely. For now, enjoy this picture of a finished sample piece taken at the convention and we’ll be sure to bring you more up to date info as it becomes available. Released just last week at San Diego Comic Con, the GX-76B Soul of Chogokin Black Megazord will no longer be exclusive to SDCC. According to the latest issue of Figure Oh, we have confirmed the release of this set in Japan. Release date has not been announced at this time, but the GX-76B Soul of Chogokin Black Daizyujin will officially be available as a Tamashii Web Exclusive. Retail price is 32,400 yen. This release will likely feature some slightly altered packaging though we don’t know what it looks like at this time. We’ll be sure to keep you updated as this story develops. The end of the Power Rangers is near – at least the Power Rangers from Bandai America. They are going out with a bang and re-releasing nearly all of their old Power Rangers Legacy stock (minus the figures). Our site sponsor BigBadToyStore.com has listed all the items for pre-order, releasing in November 2018, and we’ve linked them for you down below! These items are scheduled to release November 2018. Pre-order these items now as it will be your LAST CHANCE to grab them before they are gone forever! Add them to your “Pile of Loot” and save huge on shipping via BigBadToyStore.com! In either an attempt to cash-in at the end of their master toy license deal or cleaning out magical mythological warehouses, Bandai America has listed through EntertainmentEarth.com a massive influx of older Legacy Power Rangers items with a December 2018 release date. This will be your last chance to own these classic and someday vintage items before Hasbro begins full production of product for the Power Rangers brand. Check out the listings below. Ironically (or not), all these items were originally exclusive to Toys’R’Us and later made available through online retailers in secondary releases or post initial wave releases. However, if you missed one (looking at you, Saba) now is your chance to grab one before you can only ever pay aftermarket. Tokyo Toy Show 2018: First Look at DX X-Emperor! It’s that time again: time for another Tokyo Toy Show! Our first stream of photos is starting to trickle in and as always: Bandai is putting on an impressive show with the latest merchandise from LupinRanger VS PatRanger. Kicking things off, we have our first look at the DX X Emperor the mecha of Pat Ren X/Lupin X in both of his modes, in addition to a set of adorable plush versions of the Lupin and Pat Ranger teams. Only the plushies have a confirmed release date as of the time of this writing: they will be released in July for 1500 yen. 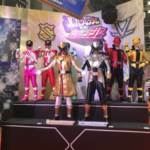 Tokyo Toy Show will be an ongoing event so stay tuned to Tokunation and we’ll keep providing updates from the event as they become available.